The Tutankhamun London exhibition includes information, housed in galleries, based on various themes including Death, Burial and the Afterlife. Comprehensive facts and information on Death, Burial and the Afterlife can be accessed by our sitemap. But this page details fast facts and info that we hope will 'wet your appetite' for Ancient Egyptian History and the Tutankhamun London Exhibition including Death, Burial and the Afterlife. Fact 7 Opening of the Mouth Ceremony was one of the most important Death Rituals of the Ancient Egyptians. The believed that this ceremony revived the mummified senses of the deceased so that he could eat, drink and speak in the next world. Fact 12 The Book of the Dead contained nearly 200 different spells which were designed to help with the tests and trials that would be met in the Underworld. 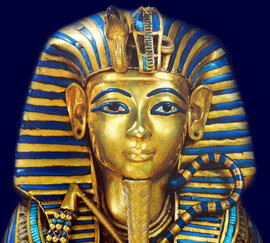 Fact 16 The Pharaoh would join the realms of the gods and all others would enter Everlasting Paradise in the Afterlife. Each section of the King Tut website addresses all topics and provides interesting facts and information about the Golden Age of Pharaohs and of Egypt London Exhibition. The Sitemap provides full details of all of the information and facts provided about the fascinating subject of the Pharaoh Tutankhamun and the Death, Burial and the Afterlife.